Shopping for Wonder Woman Travel Cups? It's like a sippy cup but for big boys and girls! And not just for big boys and girls, either, but for adults too. Able to hold up to 16 ounces of liquid, this Wonder Woman Plastic Flip Straw Cold Cup is the perfect thing for you to carry around your cold drink while on the go in DC Comics style. 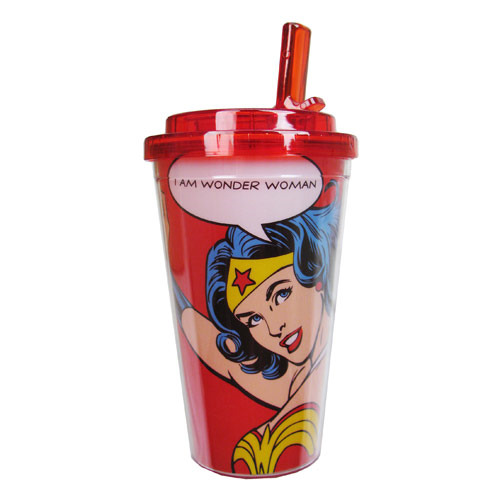 Not only does it feature a great image from a classic Wonder Woman comic with the Amazonian Princess saying, "I am Wonder Woman," but it also boasts a double-walled design to help keep your drink cold plus a cool flip straw to help keep you from spilling!